One shipping container has two speakers and an “all in one” SACD/receiver combo unit. The receiver has an extra PC board that adds network capabilities and Internet radio, iPod connectivity, the ability to read audio data from a USB stick, and satellite radio connectivity (Sirius and XM). As with all equipment of this type, it is best to get a money-back guarantee with no restocking fee from the vendor to ensure the unit works with your hardware and software before committing to it. Switched mode without feedback, Digital input and time quantized 1 bit output. iPod player connection (analog connection requiring ADC to convert signal back to digital. Support for selected operational function through players TX and RX digital control lines. See instruction manual for details. From the user manual: “Some formats are not available for playback although they may be listed as playable file formats, Also the compatibility of file formats varies on the type of server.” For complete information on extensions, stream types sampling rate, quantization, bit-rate and VBR and CBR support, see the instruction manual. The manual also covers potential playback behavior problems over the network and troubleshooting network problems. The XC-79 has a high-tech look with touch controls for the SACD player on the top of the unit. A nicely finished metal top covers the rest of the unit. High-quality plastic replaces what formerly were wood side panels on Pioneer’s flagship Elite units. High-efficiency amplifier and power supplies obviate the need for vent holes around the unit, with the sole exception of one at the bottom of the right panel to vent the power supply’s fan. For those who enjoy tinkering, I caution you not to take the unit apart without the service manual, lest you find yourself unscrewing PC boards and breaking plastic clamps on the side panels. The X-Z9 might be the ultimate executive stereo system, a sentiment not lost on the Japanese website, which dutifully portrays this application. The Japanese site holds far more information on the unit than other countries’ websites. There’s no English to be found, though, on the Japanese site. I got by with the instruction manual, the service manual, and the Babel Fish Translation program of the Japanese website. Unfortunately, Babel Fish only translates text characters at a rudimentary level. Much of the Japanese web- site has characters that cannot be read as text, which is the only thing Babel Fish can translate; I was able to translate only about half the pages. Many times the exercise left more questions than answers. Skipping the networking functions for the moment, the key feature is the all- digital path from the SACD/CD player direct to the one-bit digital switching amplifier, which functions as the digital- to-analog converter in the signal chain. Op amps, bypass capacitors, switches, and potentiometers in the signal path are all gone. Hurray! Not only is the signal path cleaner (assuming the DSP code is done correctly), but it is also more reliable than most two-channel equipment. Traditionally, mechanical switches and potentiometers are at the bottom of the reliability league tables for audio electronics, although these won’t take the unit down like a problem in the power supply. Mechanical controls and switches have long been banished from AV receivers, where CMOS switches have replaced them. Lower down on the evolutionary chain, most two-channel units, however, still have them. Any control knob on stereo equipment with physical stopping points is routing your audio signal through metal touching carbon. In contrast, the rotational sensors common to AV receivers and used on the XC-Z9 only convey information to a microprocessor. The DAC in the SACD player box connects via cable to the analog input of the stereo receiver. Analog electronics must drive the cable in the SACD player, mute the output on, turn on and turn off, and protect the electronics from damage were someone to mistakenly connect a line output from the receiver to the SACD player’s output. At the input of the receiver, it is necessary to buffer and protect. While cables are transparent, dirty plugs and jacks can degrade signals. To determine how the unit sounds with respect to the digital path (excluding the analog switching electronics that drive the speaker), I sourced signal out of the headphone jack (which has its analog signal derived from the same one-bit switched signal that drives the speaker’s power amp) and connected it into my $6000 NHT Xd DSP active loudspeakers. I heard no difference compared to my reference electronics. The analog electronics in the power amp for converting the one-bit switched signal into analog are a different kettle of fish. The XC-Z9 electronics are designed to drive the S-Z9 speakers. That gives the designers knowledge of the speaker load, and the power needed to drive the speakers to their limits. The 4 S-Z9 speakers allow for maximum power transfer from an amplifier with the low power supply voltage rail of 21V used in the XC-Z9. The output of the XC-Z9 electronics is balanced, so the peak-to- peak voltage across the speaker terminal is 42V, ignoring losses in the switching transistors. Assuming a 2V loss in the switching transistors, the XC-Z9 would deliver 45W average power. Pioneer specs the unit at 40W at 1% THD. The power transistors and drivers can handle a larger supply voltage and produce more power, but thermal is sues in the power supply and the power amp—when placed in a small enclosed area with only a tiny fan—limit the maxi mum power supply voltage. The power supply would grow in size were the sup ply rails to increase, as the power supply would be required to sink more current as the voltage at the speaker terminals increases. The incumbent fits snugly in the box. Clearly this is an element where the aesthetics of the XC-Z9 took priority to maintain the box’s compactness and hide the ventilation. The limits on the maximum power the speaker can handle also come into play. The S-Z9 speaker has been tuned to 45Hz despite its 5” woofer. I could easily drive the speaker to 20% distortion at 50Hz without clipping the amp in the XC-Z9. I heard lots of port noise as well. Hoffman’s (the H in KLH) iron law states that if you want low bass in a small box, you pay with an inefficient design. The little 5” driver can handle only so much. Above 150Hz the amp places the limit on the SPL. Because the power amplifier is a switching amp, all sorts of design issues limit distortion performance. For the XC-Z9 THD at full power, Pioneer specs it at 1% from 20Hz - 20kHz. Because the XC-Z9 is customized for the S-Z9 speaker, I did not audition the XC-Z9 with other speakers. With an estimated 20W into 8 you would not need double-blind conditions to hear trouble approaching. Even if power levels were un constrained, the mismatch of the internal passive analog output filter (required to prevent the digital switching noise from exceeding FCC limits when connected to the speaker cable, which would act like an antenna) into an 8 load would result in a rising frequency response at high frequencies. This is a problem with all switching power amps that lack feed back around the output stage. A class D amplifier from D2Audio (not used in the XC-Z9) actually does a pre calibration, measuring the frequency response at the output terminal and correcting the errors in its DSP engine. Hence, I have unlocked the justification for squeezing the XC-Z9 and the S-Z9 into the same box: impedance matching. Switching to ergonomics, there is no need to fret about universal remote controls with all the electronics in one box. Do not lose the remote, which has over 50 buttons (all but one the same color and most the same size and shape). All you can control from the front panel is the SACD player and switching the inputs. As a stereo unit, there is no television to display complex graphic user interfaces. To display the information needed for such complex functions as Internet or satellite radio, Pioneer has co-opted the display technology from its automotive division and supplied a Full Dot White OEL (Organic Electroluminescence) design. The design is so well structured you can get more information out of it than from the high-tech GUI of an expensive AVR on your TV screen. For instance, with XM satellite radio, you get the channel number, channel name, what the piece is, and who’s playing. Classical music information is limited, but I think that may be a function of XM. A button click on the remote shows the signal strength of both the satellite and terrestrial feeds. Now you can orient the satellite radio antenna correctly. I did not have a Sirius radio front end, so I do not know what is displayed when using that service. Strangely, the title and track information for a CD or SACD are not displayed. I thought I had the unit in some special display mode, but I found no way to get out of it. Maddeningly, the instruction manual has not a single picture of the front panel display. This sometimes leaves one to self-discovery by hunt and peck on the remote control and watching the display, even though most key press sequences are discussed in the text. Given the complexity of this unit and its $ 1000+ price, a 45-page instruction book with minimal graphics is unacceptable. The networking functions in the Yamaha 2700 networked AV receiver I tested a couple of years ago consumed lots of ICs, board space, and money. Pioneer takes advantage of the next-generation Bridge Co DM85OE Media Networking Processor and its associated software. On board are a media processor, an ARM microprocessor, Ethernet Media Access Controller, memory controller, USB2 interface, digital audio interface, and something called a Security Engine. The missing elements are some FLASH ROM, an SRAM, and an Ethernet chip that does the processing to interface the Ethernet cable to the Media Access Controller on the Bridge company chip. The hardware would be useless without the software and firmware supplied by Bridge. Some of the Bridge software can interface DM85OE with the iPod. One worry here is technical support from Pioneer. Suppose the roadblock is the Bridge code when interfacing your peripherals to the XC-Z9. You can envision much hand-wringing as the tech support person at Pioneer blames your peripherals when the problem is deep inside the networking card. That said, I had no need to call tech support. You cannot test how well your computer’s hard drive networks to the XC-Z9 to download music files in a store, which is why you need to have plan B in your back pocket to return the unit. I did not test the download functionality because I do not have any music files on my computer. Can you imagine how much room on your computer it would take to store the complete works of Mozart as an uncompressed file? With so many classical uncompressed CDs free of digital rights management at Berkshire Record Outlet priced equivalently close to a download, I am hard-pressed to find a reason to start downloading. I’m interested to learn how many readers (not your children) are downloading files to a computer. The Internet radio uses the Vtuner server. The Vtuner website describes what is streamed. Navigation with the high- resolution display of the S-Z9 is a breeze within the limitations of the six-button navigation system on the remote control (up, down, left, right, enter, return) and Vtuner’s configuration of the stations. The analog tuner is a simple design. Good tuners in automobile front-ends and table radios with HD radio digital signal processing receivers will pick up many more stations cleanly. That said, the XC-Z9 was more sensitive than tuners I have tested in AVRs with price tags above $2000 (in general, the same tuner module that goes in the $200 AVR goes in the $4000 one). I connected a big indoor antenna with directional control (AudioPrism 8100) and found more stations coming in cleanly than I would have expected. You can force mono but cannot defeat the stereo blend function. I suspect the blend may be aggressive, which accounts for the low background noise on what I think are signals with marginal levels going into the tuner. Despite the high-tech display, there is no signal strength indicator for FM. A little antenna does appear with three curved bars around it, reminiscent of the signal strength indicator on your cell phone. At first I thought it was a signal strength indicator, but the number of bars never changes, and the user’s manual is silent on this issue. If you use the piece of wire supplied with the unit that they call an FM antenna (they do not even supply a dipole antenna), then all bets are off regarding your reception. Accordingly, you may find yourself using the Internet radio for all but local signals. Note that all the stations you want may not be available from the Vtuner service, or the station may send only a low bit rate signal. In that case, buy an external tuner. HD tuners with remarkable performance start at $99, and some, such as the Sony XDR-F1 HD have very small form factors. The XC-Z9 has something called Sound Retriever to enhance the sound of a source recorded or streamed at a low data rate. It is implemented in a DSP chip in the digital signal path of the XC-Z9. The instruction manual de votes fewer than 50 words to this function and when to use it. The Japanese website is more informative if you can read Japanese. A graph on the site which needs no translation shows that the system generates higher energy spectra at the higher end of the audible band. I found it effective for very low bit rate signals (less than 64kbits/sec). It also worked for higher bit rate signals that had been badly encoded—a common problem with Internet radio stations. The stations that do a good job of encoding and streaming a signal do not need the processing. XM satellite radio signals could benefit since the XM PC board in the SV-Z9 supplies a digital signal directly to the digital signal bus connected to the DSP processor. The first DSP processer stores the code for the Sound Retriever. XM appears to use a significant amount of companding on some stations, so the Sound Retriever did improve the sound quality on many channels. My impression of the enhancer when dealing with low bit rate signals is that the high-end is extended, but the bass is also pushed for reasons I do not understand. Engaging the enhancer may increase the absolute level of the signal. A number of signal-processing algorithms can enhance compressed digital data. I do not know which method Pioneer adopted. Strangely, you can enable the enhancer with analog inputs such as a tuner and even CDs. With analog signals it must be a totally different animal, and not one I found I would want to invite into the house, as it never improved any analog signal. In analog mode the frequency response was within 1 dB of the response I got by setting the bass and treble controls to maximum be low 10kHz. Above 10kHz the Sound Retriever returned to 0dB. I thought the Sound Retriever response would change with signal level or signal spectrum, but changes in input gain made no difference in the shape. Going from making measurements by sweeping a sine wave to using an MLS noise as the input signal did not change the frequency response of the Sound Retriever. I assume the enhancer in analog mode is totally different from the digital enhancer. Remember that the iPod and Sirius radio signal come in analog. A DSP enhancer cannot enhance anything without seeing the compounded bits. The DSP needs to be part of the process of converting the compacted data back to PCM, implying the signal is truly “enhanced” through improved decoding algorithms. The unit’s “Sound Modes” are called “vivid” (producing a lively sharp sound is what the instruction manual says it does), “exciting” (dynamic, stimulating sound), and “relaxing” (laid back sound). This appears to be similar to the options in some car stereos. I can under stand the function with road noise and cheap speakers placed sub-optimally in a car, but the X-Z9 design touches the state-of-the-art. The only sound mode you want is Off! The loudness contour did not change with volume position; it is the same as the Exciting Sound mode to 1 kHz. They can be activated together bringing the bottom end up 14dB! At least the unit is smart enough not to allow the bass control to push this up any further. Inside, the unit is stuffed with electronics. The dominant item is the switching power supply encased in a metal shield to reduce RFI. The shield is 8.5” x 5.5” x 2”. The power supply dominates the weight of the unit and requires a fan to cool it. The main PC board, containing most of the analog and digital electronics, is on top of the power supply and is almost as big as the top of the power supply. This board is double-sided with through-holes, as are the other PC boards in the box. On the side of the power supply is the 2,5” x 4” network board. The satellite radio board is about as large as the back right side of the unit. The power amp is on a 4” x 7” board toward the left rear. More than half the board holds the analog LC filters that remove the high-frequency noise from a switching power amplifier. Because the inductors must pass the entire signal to the speaker, nonlinearity effects such as saturation of the inductor under large current flows could result in distortion. The inductor looked like a standard component, but the Japanese website appeared to highlight the design. Unfortunately, I could not figure out what they were talking about using the translation software. Because the outputs signal is balanced, two inductors are required for each channel. Pioneer winds the two inductors on one ferrite, forming a transformer that increases the effective inductance and may reduce even order distortion from the inductor. The heatsink for the power amp is microscopic at 2” x 2” x 4”. The dominant heat producer is the switching power supply, not the power amp. As I said be fore, the power supply has a fan. The SACD player lies ahead of the power amp board and to the right of the power supply. The electronics for the SACD player lie under the mechanicals for the player. Dwarfed in size is an all-analog 1980s technology tuner. It is all of 2” x 2” x 1”. I assume a DSP-based HD tuner would add about $50-s 75 to the price of the unit, so Pioneer probably figured this could not be justified with all the network, iPod, USB, and satellite radio capabilities. The switching power supply has a similar design to your desktop PC. The design details of a switching power sup ply are beyond the scope of this review; the basics are on the web and details of making one work properly are voluminous enough to consume complete textbooks. See the sidebar for a quick executive summary. Housing all the electronics in one box allows for a unique signal flow. The primary flow is purely digital audio up to the switching transistors of the power amp. The SACD player’s digital out put (converted to PCM from the DSD stream), along with the digital output of the digital media board, and the XM radio module are selected and sent to a Freescale DSP processor (DSP56374), which may just do no more than the “Sound Retriever” function (I do not have any details about the code in the Freescale DSP), although it is likely a part of the digital volume control. The Digital Noise Reduction function must also be done here. The DSP56374 is a fixed-point 24-bit processor with the ability to perform 150 million multiple accumulates per second. The signal then enters another DSP processor associated with the switch power amp. It converts the PCM audio signal into the one-bit switching signal that will eventually drive the speakers. The integrated circuit is the TI TAS55O4A. In addition to the computations to develop the one-bit switching stream, the DSP section provides seven orders of bi-quadratic filters, with two operative for the tone controls in the XC-Z9. The sound mode and loudness function may use some of the other bi-quadratic filters sections; I assume most are not used and could be saved for room correction (discussed further). The TI chip also provides functionality for the digital volume control. The TI TAS5504A drives a pair of TAS5142 chips (left and right). The TAS5142 steps up the low-level digital signal voltage from the TAS5504A to a level that can drive the power transistors’ gate. The power transistor’s switch lies between the power supplies (21V or ground) and the speaker terminals. The power transistors are in a balanced bridge configuration to reduce distortion and are included as part of the TA55142. As discussed, the output of the power transistors drives the second order LC filter connected to the speaker terminals. One TAS5142 chip contains four channels of switchers, which would allow for a balanced stereo pair in one chip. The XC-Z9 uses one TAS5142 for each channel. They parallel two channels of the TAS5142 to reduce voltage drop across the switching transistors when high cur rent is flowing to the speaker. Class D amplifiers are distinguished by the fact that the output signal switches, in most cases, between two levels. Class D amplifiers can be classified into many sub classes. The most significant difference is the nature of the output signal. Because the output can have only two levels it is the amount of time that the amplifier stays at one level that determines the analog output voltage after filtering. In the oldest form of Class D amplifiers the time that the amplifier can hold the output at one level can take on any value. After filtering, this type of class D amplifier can produce an output voltage of any level. It should thus produce a time varying waveform without distortion ignoring distortion from real semiconductor switches. One limitation of real switches is the finite rise and fall time. These set the minimum time a level can be held. In another embodiment of a class D amplifier the switching time may only be allowed on a clock edge of a digital clock signal derived from a crystal. In this case the time that the amplifier can hold a single value is quantized. The smallest time a value can be held at is one clock cycle and each larger time interval is a multiple of the clock cycles. The time that one level can be held is thus quantized. This leads to distortion of the recovered analog signal even with an ideal back end. If a class D amplifier is designed to accept a PCM digital input directly and has a quantized in time output then it can be designed using just digital cir cults. The TI TAS5504A is an example of this type of class D amplifier. The TA S5504A also includes an internal digital signal processor that anticipates the distortion at the output from the time quantization and tries to correct it by pre-distorting the signal before it is sent to the all digital Class D amplifier, The most significant issue with this de sign is its lack of feedback from the analog output to the processor. This means the amplifier has no power supply rejection and cannot reduce distortion caused by the non-ideal switching of the power transistors. This explains the unit's high full power THD in comparison to class AB amps. Without feedback, the amp's frequency response is sensitive to the speaker's load. The fact that the X-Z9 includes speakers resolves this problem. The TAS55O4A family was released in first-quarter 2006 and has innovative nonlinear signal processing to work around some fundamental problems when crafting an all-digital switching power amp without feedback. The innovations enabled a reduction in the near baseband high-frequency noise associated with the square-wave switching signal while simultaneously dealing with the issue of limiting the number of times the output signal switches state. Energy is used every time a switch occurs to move the filter connected to the speaker terminal from 0V to 21V. In addition, energy is lost when the two switches are on momentarily at the same time causing current to flow from the 21V supply into ground. While the TI chips perform well, the newer D2Audio chips have less distortion than the TI feedback-free designs. This is accomplished with digital feed back from the speaker terminal. The D2Audio design also has a digital power supply feed-forward correction sys tern that allows the chip to reject some noise on the power supply rails. I do not know the relative costs of the D2Audio chip and the TI TAS55O4A. Using a dedicated speaker for the XC-Z9 as part of the X-Z9 complex mitigates some of the problems associated with a feedback-free digital switching amp. In a switching power supply, the 60Hz incoming AC is rectified to DC and filtered lightly. A switching transistor is connected between one side of the rectifiers output and one side of the primary of a transformer. The other side primary is connected to the other DC voltage at the full-wave rectifier output. The switch is opened or closed at a high frequency. The circuit that controls the switching transistor gets feedback from the power sup ply’s output voltage developed on the secondary s of the transformer. The time the switch is activated depends on the current draw at the supply’s output. The switching action results in a time-varying voltage with a typical average frequency of 50-200kHz. Large transformers are required to efficiently pass power from the 60Hz power line to the secondary in a linear power supply. In a switching supply the transformers can be very small and more efficient with the primary frequency at 50kHz. In a switcher, some electronics live on the AC line prior to the transformers. Optical couplers will feed back information about the voltages on the secondary supply of the transformer to the circuitry on the AC line side. For safety, the secondary side is totally isolated from the power cord as in linear power supplies. The XC-Z9 has two separate switching supplies and two transformers. One is dedicated for the power amplifier’s output transistors. On the secondary side the 12V analog rail is reduced to 5V for the digital components by another switching regulator. Efficiency and size reduction are not cheap. The power supply has three analog LSI circuits to oversee the operation. Five feedback loops require five optocouplers. To sup port all this are 100 discrete transistors, diodes, and passive components. All the switching produces noise on the power supply’s output and the feedback can interact with the load at the output of the switching supply. This is why most designers of switching power amps (the unit that amplifies the music signal that drives the speaker) consider the design of the switching power supply (the unit that takes the AC line voltage and produces the DC voltage for the power amp) to be an integral part of the design of a 1 switching power amp (the unit that amplifies the audio signal and drives the speaker). To sum up: it’s not easy being green. Pioneer has chosen the Bang & Olufsen ICEpower ASH high-efficiency amplifiers for its high-end audio-video receivers. ICEpower provides modules in stead of chips. The modules combine the switching power amp and the switching power supply, preventing noise and distortion that results when a mix and match approach is used. The ICEpower design uses analog feedback loops, an analog input, and the requisite digital-to-analog converter. The measured performance presented on the ICEpower website is significantly better with respect to out put noise and distortion than the digital- based amps. The ICEpower is a more ex pensive solution that may have increased the price of the XC-Z9 significantly. The headphone outputs also start as digital one-bit signals from the TI TAS5504A. They are filtered with an RC low-pass network and then converted to analog. An NJM2068 buffers the filter and drives the headphone. This is a surprising choice because it is rated to drive 2k-Ohm loads. I was expecting the traditional NJM4556 that can drive 150 ohm loads. The NJM2068 is not a cheaper chip and is often found in many audio products during a variety of internal functions. The NJM2068 has twice the gain bandwidth and slew rate compared to the 4556. These differences should not be an issue when driving a headphone with an analog signal, but it must have been with the filtered one-bit switched signal. I cannot understand why the output of the 2068 is not buffered by an additional 4556. The fact that the headphone jack is a mini plug in this unit indicates that only wimpy headphones can be connected here. For a unit with such high-end protections, wimping out on the headphone section is a major disappointment. Analog signals must be fit on top of the digital integrated amplifier architecture. A CMOS switch lets you choose from the analog (two-line) inputs, iPod, Sirius satellite radio, AM/FM tuner, and the output of the phono preamp. These analog signals are converted to digital by an AKM5358 chip, which has a worst case, A-weighted, signal-to-noise ratio of equivalent 15.5 bits and a THD equivalent to 13.5 bits. While this is good enough for the internal analog signals that flow in the XC-Z9 (tuner, iPod, and so on), quality may be sacrificed depending on the performance of the analog device connected to the line inputs. Given that the SACD player is internal to the XC-Z9, it is unlikely the analog components connected to the XC-Z9 will require higher performance ADC to ensure that significant distortion and noise is added to the incoming signal. The ADC is a good match for the internal phono stage. The analog line output for a tape recorder requires its own DAC to convert the direct digital input signals back to analog. A TI PCM 1742 performs this function. It has a worst case, A-weighted, signal-to- noise ratio equivalent to 16.5 bits and a worst-case THD equivalent to 14 bits. Note that this unit strangely has no S/PDIF inputs or outputs. Given the digital nature of the signal path, these would have been a natural addition. Those would be used for a CD or mini disk recorder with S/PDIF connection. With the S/PDIF connection you could achieve better performance by removing the ADCs and DACs from the signal chain if the XC-Z9 had the appropriate connections. Some HD radios and external phono pre amps also have S/PDIF outputs. The phono stage is a single op amp design typical of a stereo receiver priced below $500. The distinctive feature of the chosen BA4560 op amp is its large low-frequency gain, which is required to accurately trace the RIAA curve at low frequencies. The phono stage is ad equate for use with a turntable in the $200-$300 range, which is likely the case for a secondary system in which the X-Z9 is employed. Use of a higher end turntable and cartridge with an external phono preamp might not be ideal given the performance limitations of the AKM 5358 analog-to-digital converter. Overall, the XC-Z9 is a lot of technology for the money. Usability is improved with the wealth of functionality shoe-horned into one box. The associated display and remote control conveniently enable high-tech features. Fitting all this performance into a compact space required much creativity on the part of the design team’s electrical engineers. This is a highly original and compact design of a true three-way speaker from Pioneer’s central engineering staff. It is finished in a fine piano black enclosure. They supply a cleaning cloth, which you had better not lose because it costs $40.95 to replace, before shipping and handling. Yikes. Pioneer also supplies the speaker cable (a replacement costs $37.95). The speakers are marked left and right, but for the life of me I could not find or measure a difference. Pioneer could not shed any light on this. The midrange and tweeter are in a coaxial configuration. The back of the speaker indicates that it uses technology from KEF and GP Acoustics, which owns KEF. At a minimum, this could be rights to KEF’s patented compound loudspeaker drive unit alignment method ( US patent 5,548,657) of the tweeter and midrange. 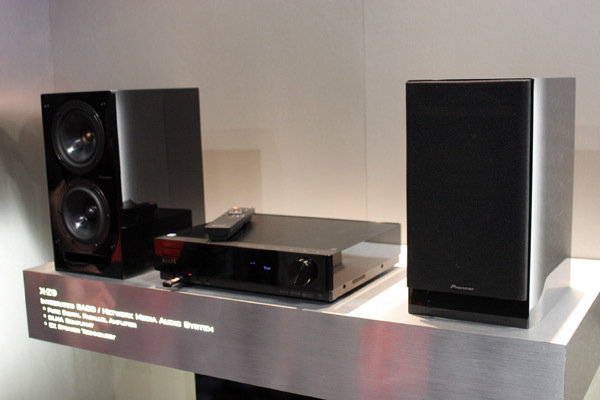 A KEF representative indicated they did not have any direct design input. The midrange has a stiff concave surround to terminate energy at the end of the cone to the cast frame of the driver. The woofer, which is the same size as the midrange, has a traditional loose convex surround. The cone moves easily when the woofer is pushed, but not so when the midrange is depressed. The three-way design is important, given the 45Hz tuning of the box and the small size of the woofer. At 50Hz, the cone moves visibly at an SPL of 85dB in a small room. This would cause intermodulation distortion were the driver to run out to 3kHz, but it is crossed over at 800Hz. From appearance, the S-Z9 is a less expensive re make of the unique Pioneer S-2EX from the Pioneer TAD group, though Pioneer indicated to me that TAD was not involved. The driver configurations are the same, though S-2EX is slightly larger with its 7” woofer. The small woofer can bottom out when playing frequencies below 150Hz in a large room at a SPL of 80dB. I band- limited an amp to 150Hz that could per form 200W into 4 and applied the last five minutes of Mahler’s 2nd symphony. The results were as clean as a full-size three-way tower speaker costing $1000 - 2000 per pair. Clearly, distortion is not an issue when the XC-Z9 drives the unit in a smaller room. A two-way mini monitor or tower speaker could not compete with respect to dynamics or clarity in the midrange between 500Hz and 3kHz. A true midrange is vital when high-end sound is the objective. In a smaller room, the unit delivers honest bass response down to 45Hz. There was no sign of the unit’s having been tuned to push up in the bass like the $10,000 mini monitors at CES, which are accompanied by marketers who talk up the pace and rhythm of the bass. The S-Z9 speakers are amiable as long as the SPLs are kept to reasonable levels. Use of the bass control, loudness, and “exciting” Sound Mode obliterate the speaker’s clean low-end and potentially damage the signal when the volume control is pushed.